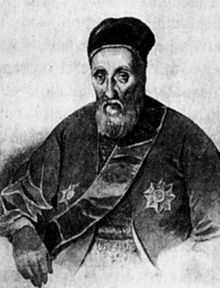 On this date* in 1799, Constantine Hangerli was deposed from his post as Prince of Wallachia by a Moorish executioner. A veritable watchword for bad times, Hangerli was one of a clutch of disposable puppet rulers situated on the Wallachian throne by the Ottomans around the turn of the 19th century. As had often before been the case, Wallachia was sorely pressed at this time by the cumulative exactions of its native boyars, the Ottoman Porte, and the plunder taken by the expeditions of rising Bosnian warlord Osman Pasvan Oglu. Our man is famous, in particular, for the “Hangerli winter” of 1798, just after his elevation — when a confiscatory tax regime seized most of the countryside’s lifestock. Hangerli had a message for the generally currency-poor common man who objected to the much-despised per-head duty on cattle. Pay the taxes, and you won’t be killed. Since it was dangerous for Ottoman generals to lose, Kucuk evidently arrived intending to put some blame on Hangerli — or at least, Hangerli thought that was the case. Secret dispatches from both parties to Istanbul ensued. Whoever it was who schemed first, Kucuk schemed best. Selim III (later to die of palace scheming himself) decreed Hangerli’s immediate execution and dispatched a kapucu, one of the frightening envoy-executioners (two different men, in this case) who carried such decrees to their victims. * I believe this may be per the Old Style/Julian date still in use in the Orthodox world. ** Having executed Rigas Feraios in Belgrade en route.